Ingress Software update comprises a set of whopping cool features that will add value to your overall experience with us. To begin with you may now download the latest Ingress release from our official website www.fingertec.com or update it online directly via the software itself. There are twenty major updates that you will come across while reading through and our team has also fixed several bugs that was standing on your way. Now you are left with a smoothers and comfortable system to ensure that you enjoy a comprehensive access control and time attendance arrangement in your workplace. Now there’s an added option to “accept edited data as original clocking” into the system settings tab. When data is revised/edited, the amended time will not be highlighted in bold .This feature is to ensure that the ‘edit’ remark is hidden and to indicate that the information displayed as the real and lastest conveyance. 2) Allow user to customize the “Absent” word in System Settings to suit their respective company protocols and culture. Prior to this, Ingress has defined absent whenever there is an absentee on a working day. This time around we have added an option in System Parameter Settings > Day Type so that the company admin may define the absentee to be addressed with a specific term deemed suitable by their company’s policy. You can now insert screensavers and advertisement into your device via the latest Ingress software release. However, this is only applicable for terminals with 3.5”and 8” LCD as well as FACE ID Series. In the latest release of the Ingress software, we have added “Weekly Wages Report”. Through this, now administrator can generate the report to check the amount of money that a particular worker earns each week. This indirectly simplifies payroll management for the HR personnel and ensures minimum miscellaneous wastages. Ingress now supports the daily automatic database backup function so that you have a copy of the database if there’s any untoward incident on the software. 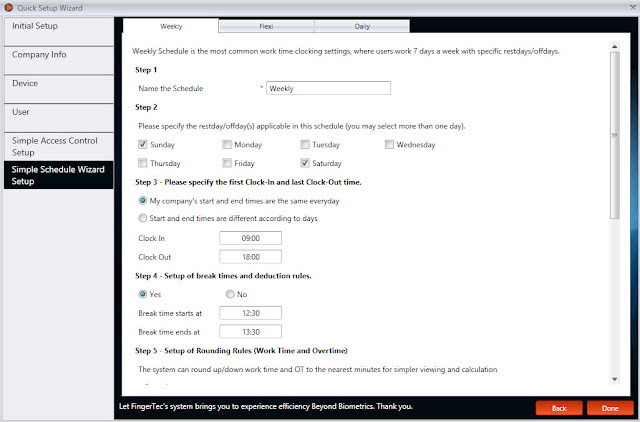 Simply set the timer each day and the system will perform an automatic backup on the specified time each day. This plus feature basically simplifies your daily back up routines and ensure that your data is safe and sound. If you only need to backup a certain module and not the entire database, you may now do so by selecting the “Backup by Module Options” in the latest Ingress software version. 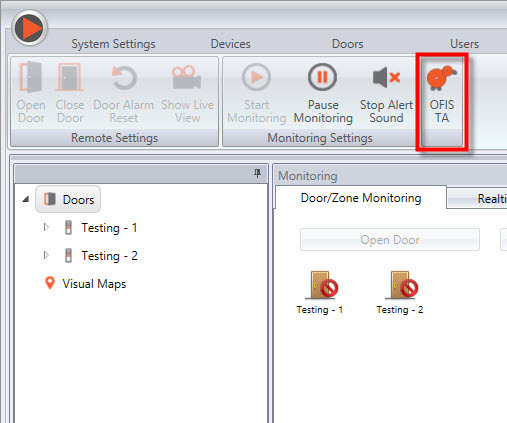 Select to backup the Device, User, Doors, Access level, Realtime Monitoring and Attendance module respectively. This feature is a big buzz for you, if your concern is to save up on the storage space. 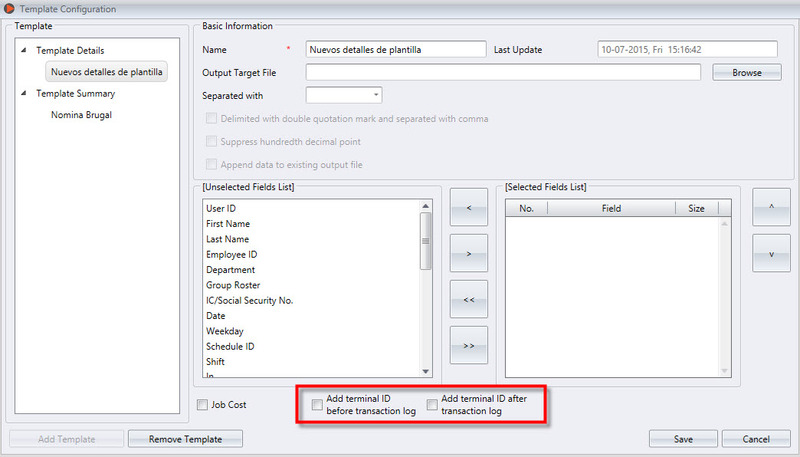 8) View salary payment mode in user’s profile and identify the nature of their job status. In the user profile, you can select the salary type for each employee, either they are paid hourly or they are a fixed pay employee. This will clearly indicate the nature of their employment status with the company. 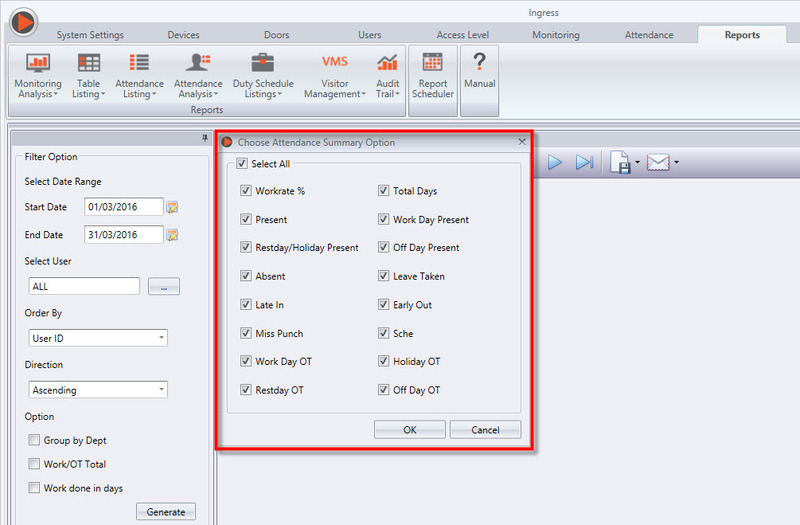 9) Skip manual updates and save time with the newly added feature that allows an Import Leave Option in Attendance. 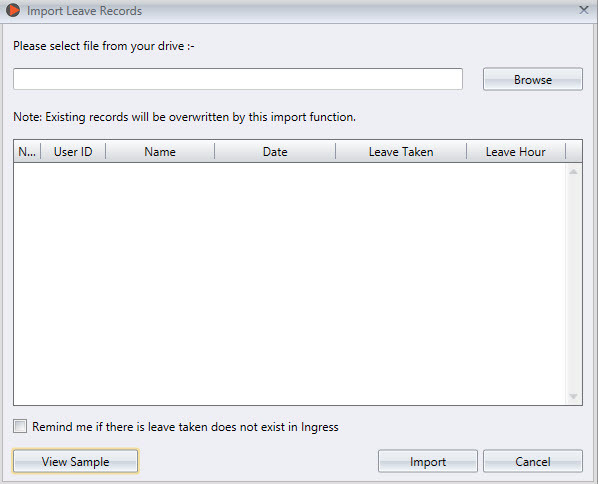 You can now import leave records by the employees without having need to edit each employee’s record manually. Instead of manully typing out the on hand records, if you have it listed in an excel format then Ingress allows you to directly import your data to the system right away, saving up on time and labour resources. 10) Ease the identification process with the newly added component, “terminal ID”. Chose to include the Terminal ID when exporting attendance details so that you can precisely locate which terminal ID does the Transaction Log belong to. You have the choice to either add the ID before or after the transaction Log. Newly featured Schedule Wizard will save you a lot of time by guiding you through the setting up process and certainly rescue you from a lot of unwanted messiness. Option is added for the Ingress server to auto-start once the Server PC is switched on. By doing so, if users wants to connect to the server via Ingress Client PC, they will not have issues to login if the PC is restarted. On the monitoring tab, user can now select the monitoring grouping (Fail Record, Normal In Out, Alarm) to view the specific notification only. In the software, you can now filter the users by group to ease the search of a particular user without having to scroll all the way down, scanning through the list. 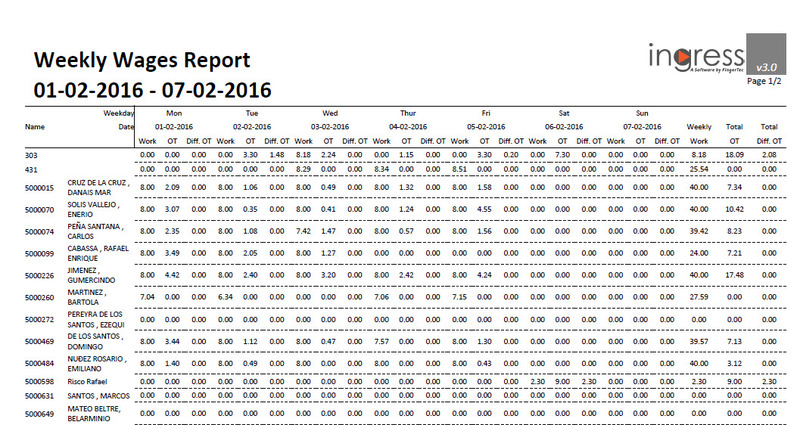 screen capture below, before generating Attendance Summary Report. 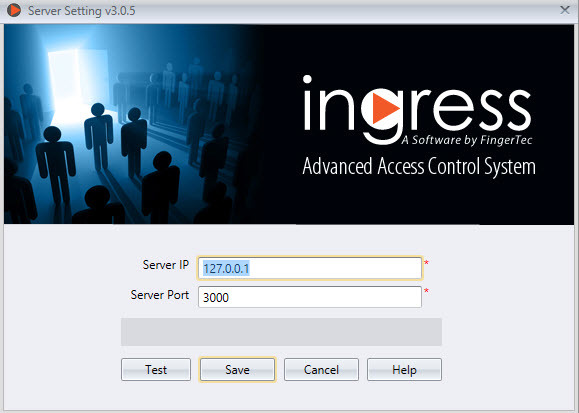 The login screen to Ingress software had been revamped to support OFIS TA login function. you are encountering with your Ingress software. In the data audit list, you may now filter the audit list according to the device itself instead of filtering through by door. By doing so, user can obtain precise raw data from each terminal. report and payroll management processing. With this newly added trait leaves can be recorded on an hourly basis and the system will indicate the precise leave hours taken by the employees and generate reports accordingly. Prior to this, in the report, you can only view the leave in days and not in hours and with the latest release, you can now select to show the leave in hours or day depending on your need. This will ease the HR personnel’s daily task to ensure that all leaves are recoded precisely and accurately for a smooth payroll management. A big plus plus point, you can now incorporate OFIS TA with Ingress software to produce an effective time and attendance system. 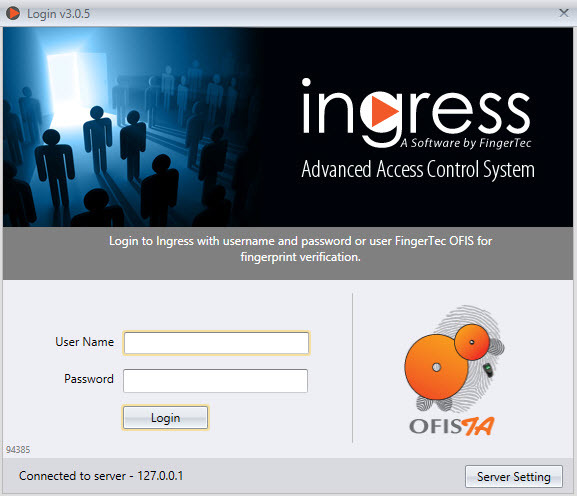 OFIS TA can also be used as enrolment stations for larger corporations that are deploying multiple units of FingerTec readers in their corporations. These additional features are deemed to support our valued users in all aspects possible for an enhanced overall experience with Ingress. Designed to wield the four main elements that make up an access control system, which are credentials, readers, locking devices and controllers this system works to purvey absolute safety precautions and with FingerTec’s Ingress you can be assured that you are in good hands! 6) Fixed wrong card number returned in monitoring page when using MiFare Card. 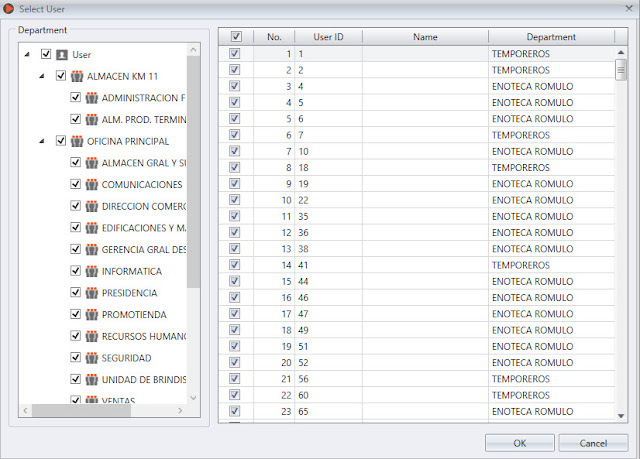 7) Fixed User ID not exported in ETC Report for Raw data mode. 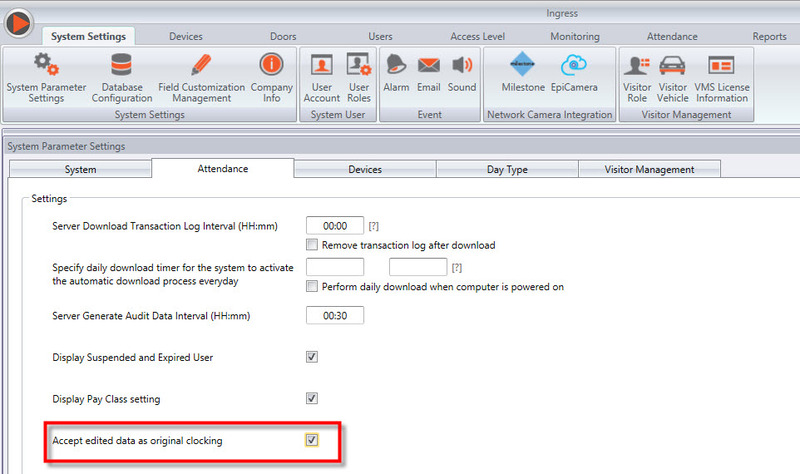 Enable Attendance Records from selected device only is configured. 10) Fixed data audit list not displaying. 11) Fixed can’t enter to a new line in report scheduler message. 12) Fixed add Holiday list not appearing in calendar view. 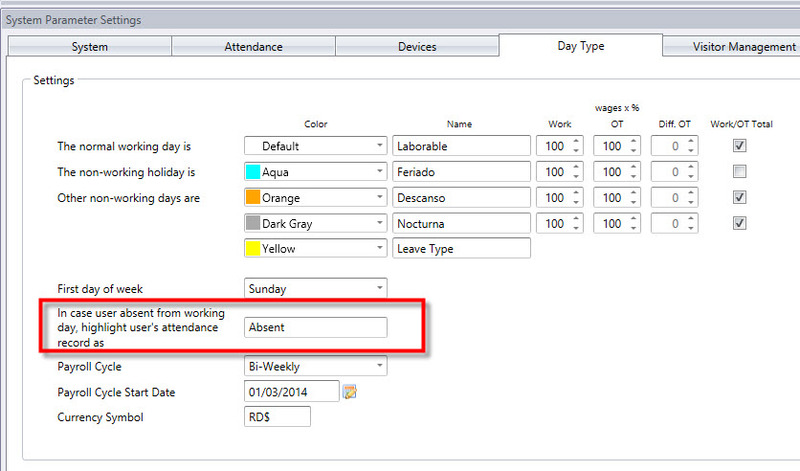 13) Fixed Holiday List Calendar showing wrong day in attendance module. 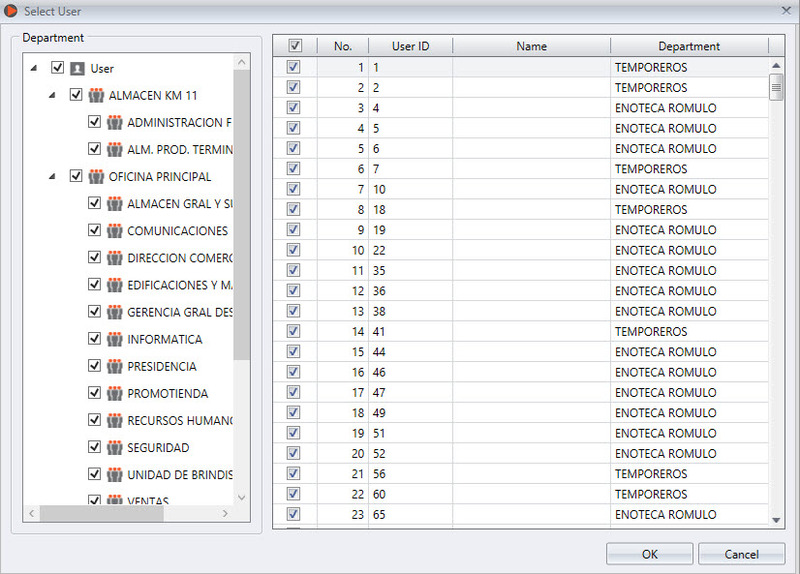 14) Fixed Data Audit List not migrated when migrating from TCMSv2. 15) Fixed Unable to load page in Attendance Module. 16) Fixed Download transaction log issue from USB for FMM firmware model. Thank you for your feedback. May I know if there any error that you face on our latest Ingress Software? You may attach the error and email to us at support@fingertec.com. Hi, I would like to ask on how to remove the list from the group roster? Do you mean you want to remove the group roster from group roster list? If yes, then please ensure that there are no users using the selected group roster, before clicking "Remove group roster". System.Globalization.CultureNotFoundException: Culture is not supported. 14345 (0x3809) is an invalid culture identifier. when i am punching it is showing a message as "checkout"
i want to change the message as "Verified"
can you help me How? Please brief us more details regarding to your query. Basically you can ignore the "Check Out' message that appear during the verification. It is because, system will generate the Attendance record base on Clocking Schedule that you create in the software.